Examination of several recently exposed cases suggests that the main police targets are anti-globalisation networks, the climate change movement and animal rights activists. The internationalisation of protest has brought with it an increasing number of controversial undercover cross-border police operations. In spite of questions about the legality of the methods used in these operations, the EU is working towards simplifying the cross-border exchange of undercover officers, with the relevant steps initiated under the German EU presidency in 2007. In October 2010 , “Mark Stone,” a political activist with far-reaching international contacts, was revealed to be British police officer Mark Kennedy  prompting widespread debate on the cross-border exchange of undercover police officers. Activists had noted Kennedy’s suspicious behaviour during a court case and then came across his real passport at his home. Since 2003, the 41-year-old had worked for the National Public Order Intelligence Unit (NPOIU) , which had been part of the National Extremism Tactical Coordination Unit (NETCU) since 2003. The NPOIU was formed at the end of the 1990s to surveil anarchist and globalisation groups as well as animal rights activists. NPOIU and NETCU report to the Association of Chief Police Officers (ACPO), but recent media coverage  has led to the restructuring of undercover police operations in the UK with the Home Secretary withdrawing NPOIU’s mandate to lead. This decision follows on from the disclosure that some undercover officers had used sexual relationships in order to gain trust or extract information. Kennedy later gave interviews  to the Daily Mail tabloid newspaper in which he recounted his infiltration activities. He said that he had been issued with tagged mobile phones through which his superiors could locate his position at any time. He “reported back daily” and regularly sent text messages to his employers. He also claims to have received – in addition to his regular salary – annual fees of €60,000 to €240,000 for his activities. Kennedy says he met 20 other undercover officers during his operations of whom five are still active. Undercover police officers are increasingly being exposed, partly due to the publication of a handbook in 2009  and guidelines for handling the exposure of infiltrators published on the Indymedia website. After pictures of police officer “Lynn Watson”  were published, another police officer, “Marco Jacobs” , was outed in January 2010. Jacobs had worked with Mark Kennedy on several occasions. According to comments posted on the UK Indymedia platform, Jacobs had been a member of Brighton’s anti-capitalist Dissent! network until 2005 and took part in protests against the 2007 G8 summit and the 2009 NATO summit. “Jacobs”, “Watson” and Kennedy were all active in the international Dissent! network, which has played a significant role in mobilising against G8 summits in Europe since 2005, and the NATO summit in 2009. Six days before his exposure, Kennedy had made inquiries to a French Dissent! group about mobilisations for the French G20 and G8 summits in 2011. When Bromma was exposed and confronted, he claimed his infiltration had served an undefined “information gathering and threat prevention” role. The regional interior minister added that Bromma had been tasked to spy on specific activists. Following regional elections in March 2011, the Green Party’s internal affairs spokesman offered a student newspaper an explanation for the increasing deployment of infiltrators abroad: he said that regional states governed by the conservative CDU (Christlich Demokratische Union) had agreed that police surveillance should focus on “Left-wing extremism.”  Because the regional government provided so little information on Brommer’s assignment, a faction of the Die Linke party pressed charges of deception against the police officer , saying he had taken part in one of its expert meetings on the future of the university, even claiming travel expenses. An undefined “threat prevention” was also used to justify a surveillance operation against the Austrian animal rights movement. This involved a Vienna-based police officer, Stefan Wappel, who “controlled” an undercover officer using the false name ‘Danielle Durand’, who arranged temporary accommodation for activists in Vienna and the Steiermark region. To establish a background story Wappel conducted “internet research and conversations” to find out “how these people think.” Intelligence gathered from ‘Durand’s’ infiltration has been used – despite the expressed aim of “threat prevention” – in police investigations. 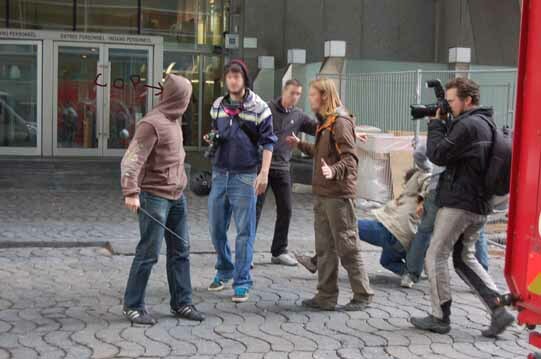 Since March 2010 it has led to the prosecution of 13 animal rights activists  under Article 278 of the Austrian Criminal Code (“creation of a criminal organisation”). They were recently cleared on all charges. Wappel received his orders from a Special Task Force. ‘Danielle Durand’ provided Wappel with information on planned actions, such as “animal transport blockades or disrupting hunts”, by sending text messages and through regular written reports. By using “threat prevention” as justification, the Austrian police were able to circumvent the need for a judge’s order as stipulated by the Code of Criminal Procedure in such investigations, and instead organised the operation on the basis of police security law. However, amendments to the Austrian Code of Criminal Procedure that came into force on 1 January 2008 stipulate that undercover operations implemented for “threat prevention” also have to be authorised by a judge. Perhaps that is why the infiltrator was “cautiously” extracted, as the responsible police chief stated in court. Since at least 2002, the police agency Europol has focused on “Animal Rights Extremism”  and Austrian Special Task Force officers have participated in conferences on the subject several times a year. “Animal Rights Extremism” also appears in the Europol annual report TE-SAT 2010: EU Terrorism Situation and Trend Report. Intelligence “relating to militant animal rights activists” is collected and analysed in the Europol Analysis Work File DOLPHIN (domestic extremism). The Council of the European Union also demands a “high level of vigilance and alertness in respect of Animal Rights extremists.”  It comes as no surprise then that ‘Danielle Durand’ was also used in cross-border operations. Stefan Wappel accompanied her to international gatherings of animal rights activists in the Dutch town of Appelscha and the Swiss city of Luzern. ‘Durand’ was also equipped with a modified mobile phone through which, according to her testimony in court, Wappel was listening to conversations in real-time. The deployment of ‘Danielle Durand’ abroad was “arranged with the [foreign] authorities.” Wappel was responsible for obtaining the necessary authorisations for the cross-border deployment of the undercover investigator, but he claims there are no records of them. In his applications to the relevant foreign authorities, Wappel claimed that there was suspicion of the existence of a criminal organisation – there is no mention of “threat prevention”. The Dutch authorities replied that he would have to apply for a new authorisation for each new investigation, while the Swiss authorities stated that the information gathered as a result of the deployment could not be used as evidence in court. While British undercover officers assisted in the infiltration of summit protests in Heiligendamm in early 2007, the German interior ministry, presiding over the EU at the time, initiated a Council Conclusion on “simplifying the cross-border deployment of undercover officers.”  The Conclusion was adopted in June 2007 and aimed at eliminating legal barriers to the international exchange of infiltrators. It foresaw an initial problem analysis and EU-wide legal measures to intensify cooperation between the Member States. The Multidisciplinary Group on Organised Crime  (renamed the “Working Party on General Matters, including Evaluations” in 2010) was mandated to further examine the cross-border deployment of undercover officers. - cross-border assistance in providing false papers for undercover officers, such as the “entry of a bogus firm in a foreign commercial register, or opening an account with a foreign bank”. These measures could “make a cover story so credible that criminal organisations are more likely to cooperate with the undercover officers“. - the protection of undercover officers' identity during police interrogations or by an examining magistrate, which are not anonymised in all Member States: when preliminary investigations are initiated, undercover officers might be exposed. In theory no government is allowed to deploy its police forces in foreign jurisdictions without prior consent. According to the German government,  “under the territorial principle of international law, the undercover deployment of a foreign police officer in Germany - as every state action of a foreign state - in principle requires the prior notification [of the foreign state] and approval by the relevant German authority”. The aim of initiatives for EU-wide standardisation is therefore principally the elaboration of a model agreement for the prior approval by the requested Member State. Joint investigation teams (JITs),  which also conduct cross-border undercover operations, will serve as an example here. The advantage is that within a JIT, judicial orders can simply be transferred to participating police officers from other countries, thereby eliminating a significant bureaucratic barrier. Requests for mutual assistance are also unnecessary. A joint Eurojust/Europol handbook supports JITs and their “informal exchange of expertise.” The two EU agencies can be integrated in a JIT at any time or initiate their creation, to the mutual benefit of all participating parties. Europol, for example, can enter the information gathered in its systems. The “European Cooperation Group on Undercover Activities” (ECG) is responsible for international communications on the “use and exchange of undercover investigators.” Germany participates through the Federal Crime Police Authority (Bundeskriminalamt - BKA) and the German Customs Investigation Bureau (Zollkriminalamt – ZKA). Its aim is the “professionalisation and coordination in international cooperation of the deployment of undercover investigators.” Their main thematic areas are the fight against “organised” and “politically motivated” crime. Its informal working groups, however, are not restricted to the EU: its members include Albania, Croatia, Macedonia, Norway, Russia, Switzerland, Serbia, Turkey and Ukraine. The German government says that the ECG is not “part of any national or intra-state institution/authority,” and therefore is not subject to EU law. It cannot be controlled by the European Parliament only, at best, by national Member State parliaments. Until the fall of 2010, the group’s existence was unknown to internet search engines, and presumably also to parliamentarians and the public sphere. The “European Cooperation Group on Undercover Activities” held its first meeting in Poland, as an informal “East and West European meeting.” A follow-up meeting in Belgium in 2002 consolidated the group. Subsequent meetings have taken place in the Czech Republic (2003), Croatia (2004), Hungary (2005), Germany (2006), Lithuania (2007), Turkey (2008), the Netherlands (2009) and Russia (2010). The meetings facilitated the “presentation of currently national situations” and recurring agenda points were the “presentation of legal, structural and organisational developments” and “information regarding training measures”. The German government claims that the group does not deal with the “coordination or regulation of cross-border deployments,” although it also says that “international cooperation” is debated through “case studies.” Contacts made within the working group will most likely be central to relevant bilateral or multilateral agreements for planned deployments. In 2003, the ECG instructed a working group to draft a model agreement to better synchronise cooperation between sending and receiving states. Details, such as the fact that foreign police officers are not allowed to commit crimes, will now be made in the form of a standardised Memorandum of Understanding (MoU), which will be signed for each deployment. This document for the “definition of commonly agreed principles for international cooperation” was presented to the ECG in 2004 by police officers from Germany, UK, Denmark, Belgium, Russia and Finland. The MoU also details how a deployment should be justified to the public in case of exposure, or if operations using agents provocateurs are possible. In 2010, the German government confirmed the existence of a Cross-Border Surveillance Working Group (CSW} , which includes Europol. The activities of this working group, however, remain obscure: Europol says its aim is “to encourage international cooperation and provide a forum for the discussion and development of safe and effective law enforcement surveillance techniques.” The German government, on the other hand, said that it is a “platform for discussion,” which aims at contributing to “the development of safe and effective surveillance techniques.” However, in a reply to a parliamentary question  the government claimed that “expert presentations on cross-border surveillance” were given at the bi-annual CSW meetings with the aim of achieving the “optimisation of working procedures.” Alongside the “operative and tactical possibilities”, the “legal framework” of various Members States was also presented. According to its president Jörg Ziercke, the Federal Crime Police Authority (Bundeskriminalamt) acted as an agent in the deployment of the British undercover officers, under the authority of Mecklenburg-Vorpommern and Baden-Württemberg regional police forces, which hosted the G8 and NATO summits respectively. The regional states, however, remained silent on the matter, although Mecklenburg-Vorpommern did say that “Mark Kennedy, or rather, Mark Stone, was dispatched by the National Public Order Intelligence Unit (NPOIU).”  An agreement “between the responsible authorities of the British police and the responsible authority of the regional police force of Mecklenburg-Vorpommern” regulated the details; among other items they stipulated that “the operational costs (e.g. travel, accommodation and food costs)” will be reimbursed, and apparently no other payments were made. The deployment took place on the basis of a “conceptual framework for the implementation of specific coordinated police measures of the regional states and the federal state on the occasion of the German presidency of the G8 in the year 2007 as well as the German EU presidency of the first six months of 2007”  which included the “implementation of undercover police operations.” A closed meeting of the Committee on Internal Affairs of Mecklenburg-Vorpommern’s regional parliament revealed that the conceptual framework recommended the “increased use of infiltrators and the deployment of informants as well as undercover police officers.” It stipulated that “in appropriate cases and in the framework of legal possibilities, informants and undercover investigators” should be used. “Deployment modalities” should be coordinated between the regional states and the Federal Crime Authority on the one hand and the foreign authorities on the other, on a case by case basis. “The increased collection of relevant intelligence and the consistent use of preventative police measures” were central to operations. The German government hereby invokes a ruling by the Federal Court of Justice, which decided in 2007 that a “foreign police officer who is deployed undercover” should be considered to have the status of an ‘informant’ (Vertrauensperson). This means the status of “private person whose long-term cooperation with the police is not known to third persons.” However, this decision does not set a precedent; it merely clarifies whether evidence gathered by a foreign police officer could be used in a court of law. Furthermore, the court was referring to a deployment for the purpose of a criminal prosecution - which the German government now seeks to apply to threat prevention. The foreign police officers are therefore bound by fewer regulations than German infiltrators. However, like their German colleagues they are not allowed to use intimate or sexual relationships for the purpose of gathering information because this would violate basic privacy rights (“Kernbereich privater Lebensgestaltung”). Even the BKA’s internal guidelines expressly forbid this, and it applies to undercover investigators as well as informants employed by the federal authorities. The German government claimed in May 2011 that it was not informed of any “tactical intimate relationship” in the case of “Kennedy” in Germany. According to Zierke, the Berlin regional state had given “very explicit approval” for the common “action” which was intended to ingratiate the undercover officer to the militant scene. Berlin’s interior minister, however, contradicted the BKA version that the state had given “explicit approval.” This suggestion, Körting said, had not even been considered by the Berlin regional state at the time. The BKA had obviously interpreted this as an agreement and given the UK National Public Order Intelligence Unit the green light for the operation. Later, the Federal Government used the following wording: the BKA “notified the responsible regional crime police authority about the measures in question.”  It concedes, however, that a possible arson attempt or other “crimes typical of the scene” were not mentioned. Zierke also claimed that the “action” proceeded “without an interventionist character or intelligence gathering.” The case has stalled because no additional information has been provided by the authorities. The Berlin Green Party intends to press charges because committing a crime is illegal, even for infiltrators. It is still unknown whether Mark Kennedy made unlawful recordings of private conversations. The Guardian newspaper reported in June 2011 that Kennedy had made a recording of a meeting preparing the blockade of a power station using a 7,000 EUR Casio watch. In the resulting court case against activists these recordings were concealed from the defence. If Kennedy recorded events in Germany, this could constitute an infringement of privacy legislation,  particularly because it was argued that the German deployment was for “threat prevention”, rather than criminal prosecution. According to the BKA president, his department did not receive reports on Kennedy’s deployment. During the G8 summit in Heiligendamm, Kennedy and the police controller who accompanied him were integrated into the ‘Kavala’ special police unit that was set up for the occasion, through a BKA liaison officer. Mecklenburg-Vorpommern alone, says Zierke, requested “three or four” infiltrators from the UK for the 2007 G8 summit, but he claimed to have no details about them. Recently it was revealed that a dozen other foreign undercover investigators were active at the G8 summit, some of them from private agencies. In order to regulate the legal status of foreign infiltrators, the BKA proposed to the police committees of the annual regional interior ministers’ conference (Innenministerkonferenz der Länder - IMK) to evaluate the “current practice concerning undercover deployments of foreign police officers in Germany” and “where appropriate develop possible optimisation measures.”  The proposal will be discussed at the IMK conference in June 2011. In May 2011, the Berlin authority for internal affairs and sports made a proposal to this effect; the decision, however, will not be made public. The British police launched its own initiative in the deployment of infiltrators at the G8 summit in Germany. According to the BKA president, German police had “received concrete information from within the anarcho-scene – also from Great Britain”, that “very serious crimes” were planned. However, “very serious crimes” did not occur at the Heiligendamm G8 summit and the BKA did not indicate that they were to be expected. Zierke’s retrospective justification, namely that “more than 400 police officers” were allegedly injured at the opening demonstration in Rostock on 2 June 2007, is also incorrect. This claim has been refuted by journalists and civil society groups – most of the police injuries resulted from its use of teargas. The tautological argument that British undercover officers helped prevent the “threat of attacks” through the “timely identification of potential agitators, including localities” was then given, (i.e. political protest was infiltrated at the earliest stage). The vocabulary used to describe international summit protesters is enlightening: the absurd term “Euro-anarchists”, for instance, is new to German-speaking parts of Europe. The spectre of “Euro-anarchists” was (according to internet search engines) first introduced by Italy’s then interior minister Guiseppe Pisanu 2003 as a “cartel of European anarchist groups.”  Prime Minister Tony Blair’s description of the protests against the G8 summit in Gleneagles in 2005 was similar. “We hate it!” Blair complained to the press, because leaders of the largest industrial nations had to hide behind a fence. Although hundreds of thousands of demonstrators blocked entrances to the conference venue, Blair held “small groups of international anarchists” responsible for the fact that the G8 leaders could not have photographs taken with local villagers. The French interior minister at the time, Michèle Alliot-Marie, created the term “anarcho-autonomous movement.”  which she claimed had excellent international contacts. This construct served one of the most spectacular waves of repression in recent years  against anarchist and autonomous groups in 2008. The term “Euro-anarchist” has since established itself in Germany. In early June, the Federal Office for the Protection of the Constitution (Bundesamt für Verfassungsschutz - BfV) informed several people retrospectively that they had been victims of a telecommunications interception from 2009. The internal intelligence agency referred to them as “Euro-anarchists” and suspected them of being “members or rather supporters of an extreme left-wing circle.” Preliminary investigations were initiated because of “indications of serious threats to the security of the Federal German Republic.” To date, no legal proceedings have been initiated. Perhaps the key to undercover cooperation against “Euro-anarchists” lies in existing EU cooperation in security matters at the G8, G20, NATO and COP 15 summits in Gleneagles, Heiligendamm, London, Strasbourg and Copenhagen. This is not implausible: it is common for police chiefs of responsible security authorities to “observe” prior to the event at other summits and exchange “best practices.”  Brian Powrie, responsible for security at the G8 in Gleneagles in 2005, travelled to the 2004 G8 summit in Sea Island, USA. Knut Abramowski, responsible for security at the G8 summit in Germany, turned to his British colleagues beforehand. Little is known, however, about the role of France in international undercover police cooperation. Undercover operations that participate with foreign police forces are managed by the Service Interministériel d'Assistance Technique (SIAT). It is very likely that the French authorities also deploy infiltrators at international summits or against climate change movements. German-French bilateral police cooperation has received the highest praise. On the occasion of the NATO summit, four undercover investigators were deployed in France. Apparently it is not only EU police forces that cooperate with each other - otherwise it is hard to explain the Indymedia report that an FBI infiltrator attempted to make contact with an activist during the G8 Gleneagles protests. Her e-mails were published on the Indymedia site: “Greetings from America”, a certain ‘Anna’ wrote, who was instrumental in the arrest of three US environmental activists from Earth First! She lauded her fabricated experiences in preparation for the 2004 G8 summit in the USA. Cooperation with Russia, also part of the G8, appears to have been unsuccessful because of continuing Cold War sentiments. Even though British undercover police officers “Marco Jacobs” und “Lynn Watson” infiltrated preparations in the UK for the 2006 G8 summit in Russia, they had to abandon their activities in St. Petersburg at short notice, according to the chronology published by Indymedia. It is suspected that Russian authorities refused to grant them entry to the country because they were using false documents. When evaluating the recently published overview of Kennedy’s activities there appear to be two main themes : summit protests (against the EU, the G8 and NATO) and campaigns against energy corporations and weapons manufacturers. The latter include the German energy company E.ON as well as Shell and BP. The exposure of British undercover police operatives provided intelligence indicating the participation of private companies in the infiltration of political movements. According to press reports, Kennedy had spied for the private security firm Global Open, and founded the Tokra Company himself. It is unknown which companies use the services of these private security companies. The multinational E.ON runs a power station that was targeted by Kennedy’s later actions, but the company refutes reports about direct cooperation. In the context of his infiltration of the Icelandic climate movement, Kennedy wrote a chapter for a book on the Saving Iceland campaign, which was published by activists. He discussed police deployment: “The Icelandic police had very little experience in dealing with protests compared to police forces in other countries throughout Europe and further afield. They are also thin on the ground, a fact that had repercussions later on.” The text is filled with rhetoric and, in retrospect, it is likely that this served to pressurise those employing him to continue to do so: “The environmental destruction that is happening throughout Iceland and beyond will continue to be protested and fought against regardless of police tactics or corporate intimidation.” Kennedy also wrote an article on Iceland  for the Earth First! Journal (published in the USA) under the pseudonym of ‘Lumsk.’ Earth First! is partially classified as a terrorist organisation by the US authorities. Europol’s 2010 annual TE-SAT report  comments that “anarchist extremists” were particularly active on issues such as anti-capitalism, anti-militarism and ‘noborders.’ In other countries, they were also active on environmental issues, climate change and squatting or migration. On the basis of the information gathered by The Guardian newspaper, and Kennedy’s statements (although these should be read with great caution), it appears that international police infiltrators are being used to undermine the European networking of anti-capitalist groups and are used by various states primarily at summit protests. It is noteworthy that Kennedy was not only deployed in several foreign countries for summit protests but he also appears to have been deployed in a cross-border context just before or during police raids. If the Daily Mail  is to be believed, Kennedy’s mission in the UK was to secure more severe sentences for activists. Rather than trespass or criminal damage, police investigations would focus on conspiracy – a strategy that has been used internationally against activists since the G8 summit in Genoa in 2001. These more serious charges are used to justify police raids and anti-terrorism investigations. The same mechanism is applied at the EU level (as well as in Turkey and Russia), where it has been used to justify the Anglo-German exchange of undercover police officers. Using self-fulfilling “risk analyses,” a threat is created and a solution (the relevant cross-border apparatus) is brought into play. Judicial clarification is prevented if it remains unclear to which German authority a relevant legal charge should be brought. In the case of Mark Kennedy.’s arson, for instance, should he be charged, his superiors in the NPOIU, the Association of Chief Police Officers (ACPO), the German BKA or the Berlin regional state?